It’s time to unearth some of those old New Year’s resolutions about getting healthy! You’ve been meaning to make it to yoga one of these evenings, but still haven’t made it happen. Well, we can’t promise this bag will actually get you to your class, but we can guarantee it’ll make you the most stylish budding yogi around! This project is all about planning. You’ll be creating each component of the bag, and then putting it all together at the end. It might seem like a lot of steps, but we promise this it totally doable and will only take you about an hour if you follow along! ? 1. All yoga mats are different in terms of size. Roll yours up and then roll fabric around it and cut fabric to size. Cut your canvas, patterned fabric and Heat Bond all to size. 2. Use Heat Bond to bond your canvas to the patterned fabric. 3. Iron the top edge of the fabric (where the bag will stay open), and then hem it. Make sure to leave enough room to wiggle a piece of rope through this hole to act as a drawstring. 4. Now it’s time to prep that pesky bottom piece. 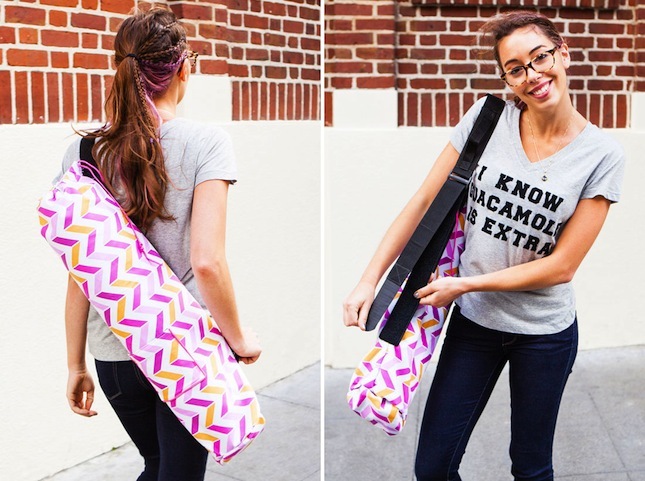 Again, measure your yoga mat and cut the fabric to size. Layer it up as you did last time, using Heat Bond. 5. Next up, we’ll create a useful pocket for the outside. We cut ours to 5×5 inches. 6. Fold and pin the piping along the edges and sew on the inside. 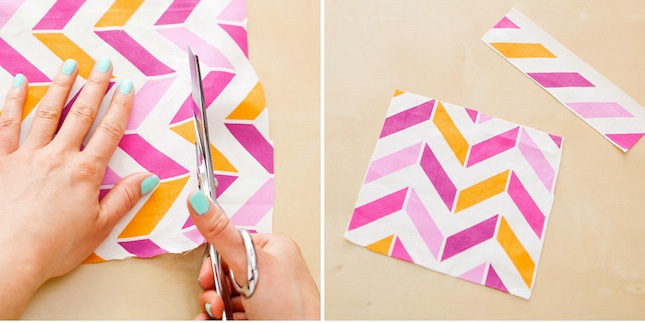 Then cut canvas fabric that will go along the inside of your pocket. 7. Cut a piece of VELCRO® Brand Sew On White Tape and attach to the top inside of the pocket. 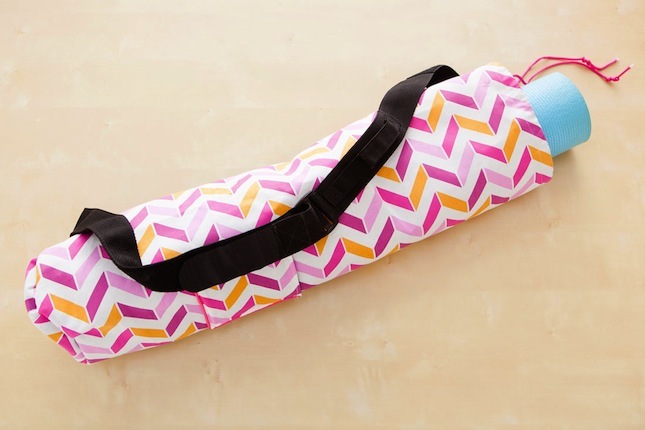 Attach the other side of the VELCRO® Brand Sew On White Tape to the center of the fabric that is about to become your yoga bag. 8. Sew the VELCRO® Brand Sew On White Tape onto the fabric, and then sew the pocket right on there too! 9. Now you’ve got this piece of fabric, and it’s time to make magic happen. Pin all the edges of the circle to the fabric. 10. Now Sew! Don’t press that pedal too hard — it’s good to keep a slow pace when attaching the bottom circle of the bag. Then turn it inside out., you’re almost done. 11. Use a safety pin to snake a piece of rope through the top seam, and then hand-stitch on the VELCRO® Brand VELSTRAP® and you’re done!